They may not look like a zucchini, but their flesh is very similar to that of a zucchini. And, they're cute as a button, round and fluted around the sides, named after a baking pan for round, fluted cakes! They come in different colors, and nutritionally are a good source of magnesium, niacin and vitamins A and C, while being low in calories. I like to pick the smaller patty pans - 2 to 3 inches in diameter. You want to give them a little squeeze - they should be firm, not spongie. You can treat them like you would a zucchini - a light saute in a pan with some garlic is an easy side dish. They are excellent on the grill; the smaller patty pans can be grilled whole. Today in the farmers market kitchen - Pickled Patty Pan! This recipe is from Cooking Light magazine. These pickled patty pans are a refrigerator pickle - no processing in a hot water bath, easy! I made quite a few substitutions in this recipe - cooking is all about being flexible! You can get the complete recipe here. Step one: Pack clean patty pans into a container that can be sealed, I just used canning jars. 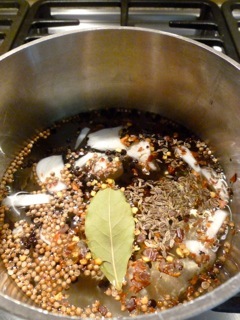 Assemble the ingredients for the pickling liquid in a sauce pan and heat to dissolve the sugar and salt. I didn't have any mustard seeds on hand so I just omitted them. While the pickling liquid is heating, add the herbs (again, I didn't have any tarragon so I substituted fresh marjoram from my garden), lemon (I added lime since I was out of lemon!) and scallions to the container. Pour the hot pickling liquid into the jars to within a quarter inch of the rim and place the lid on the jar. Store in the fridge for a few days to allow the flavors to develop. These pickles are great! Perfect with burgers and hot dogs! Pretty too!